What does patient satisfaction mean? Patient satisfaction survey results enable the hospital team to hold itself accountable and continuously improve in serving patients and families. 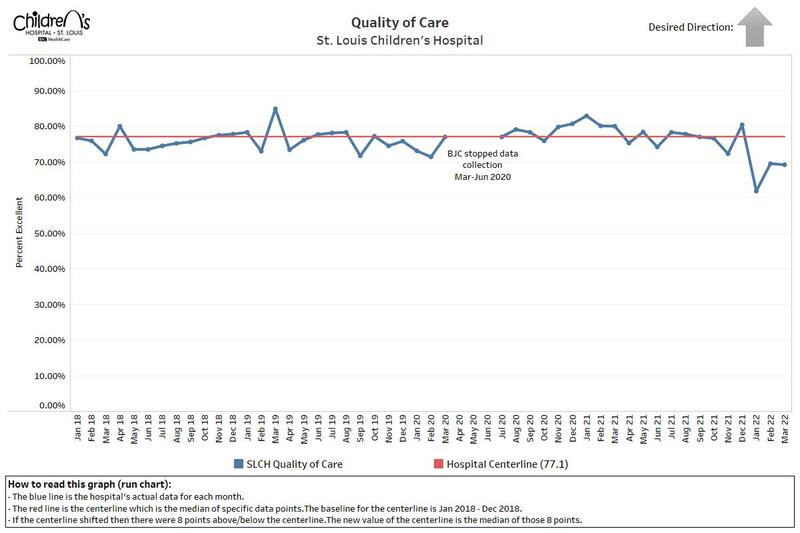 Through a confidential telephone survey after discharge, patients’ families are asked to rate the care their children received while a patient at St. Louis Children's Hospital as either poor, fair, good, very good, or excellent. The patient satisfaction score corresponds to the percentage of respondents who rate the hospital as excellent, as the hospital strives for excellence. Survey recipients also can comment on their hospital experience. The survey is conducted by an outside firm that measures patient satisfaction for thousands of hospitals nationwide. Rewarding hospital staff each quarter for achieving high patient satisfaction goals. Recognizing hospital staff on an ongoing basis for outstanding efforts in providing safe care, effective care and exceptional service. Offering orientation and ongoing curriculum for staff that focuses on improving the patient experience. Including family participation and feedback in hospital programs and services through a Parent Advisory Council and a Youth Council.